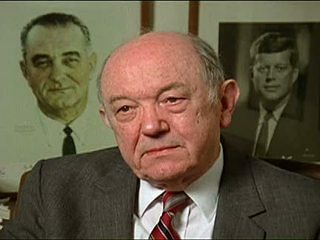 Dean Rusk was the United States Secretary of State from 1961  1969. He details the events in Vietnam during 1964, when President Johnson was involved in an election campaign. Mr. Rusk gives an inside-the-administration perspective on the Tonkin Gulf Incidents, the debate over whether or not to bomb North Vietnam, and how to keep China and the U.S.S.R. out of the conflict. He discusses the escalation of American forces, the Tet offensive, the decline in public support for the war, and his view of the peace negotiations. He explains why the United States had to get involved in Laos, but could do little more than sporadic shelling in Cambodia. Mr. Rusk illustrates some personal and political qualities of President Johnson, and offers his analysis of the Vietnam Wars lasting effect on the United States. Chicago: “Vietnam: A Television History; Interview with Dean Rusk , 1981,” 04/28/1981, WGBH Media Library & Archives, accessed April 25, 2019, http://openvault.wgbh.org/catalog/V_BE368E0B83284807A4F1DFAAFB6B9A8B. MLA: “Vietnam: A Television History; Interview with Dean Rusk , 1981.” 04/28/1981. WGBH Media Library & Archives. Web. April 25, 2019. <http://openvault.wgbh.org/catalog/V_BE368E0B83284807A4F1DFAAFB6B9A8B>.